It is now more than 30 years since attempts started to find a way of defining the kilogram based on an atomic constant or a fundamental physical constant. Since then, two methods have advanced sufficiently far to make it likely that there will be a new definition within the coming years, namely the Watt balance ­experiment for determination of Planck‘s constant h and the Avogadro experiment for determining the ­Avogadro Constant NA. Both numerical values can be converted to the other by use of the molar Planck constant NAh, the value of which is known extremely accurately. However, until now, the differences between the results of the Watt balance and Avogadro Project combined with the corresponding uncertainties were not statistically reconcilable, a situation which has now changed positively thanks to new results. In Issue 4/2010 of the periodical Chemie & more, we reported on the successful new determination of the Avogadro Constant. Meanwhile, in Autumn 2011 in Paris, the general conference of the Metre Convention, based on the proposal of its advisory committee, agreed with the concept of linking all base units back to fundamental constants and consequently of linking the kilogram to Planck‘s constant h. However the moment for this new definition will only be reached if the measurement results of both the Avogadro and the Watt balance experiment have achieved the necessary agreement both in terms of numerical value and measurement uncertainty. This means that one of at least three independent experiments must have achieved a relative measurement uncertainty of 2 x 10-8, and the remaining two at least 5 x 10-8. The results must also agree within a 95 % confidence interval, i.e. their “error bars” must overlap. These results will define a more accurate value of Planck‘s constant, which is binding for all users and therefore also for the definition of the mass unit, without measurement uncertainty. In the Avogadro project, the number of atoms in one mol of silicon is determined. As it is not possible to individually count the atoms, the regular layout of the atoms in a crystal lattice is used. In an ideal case, a silicon crystal comes very close to being a perfect crystal. 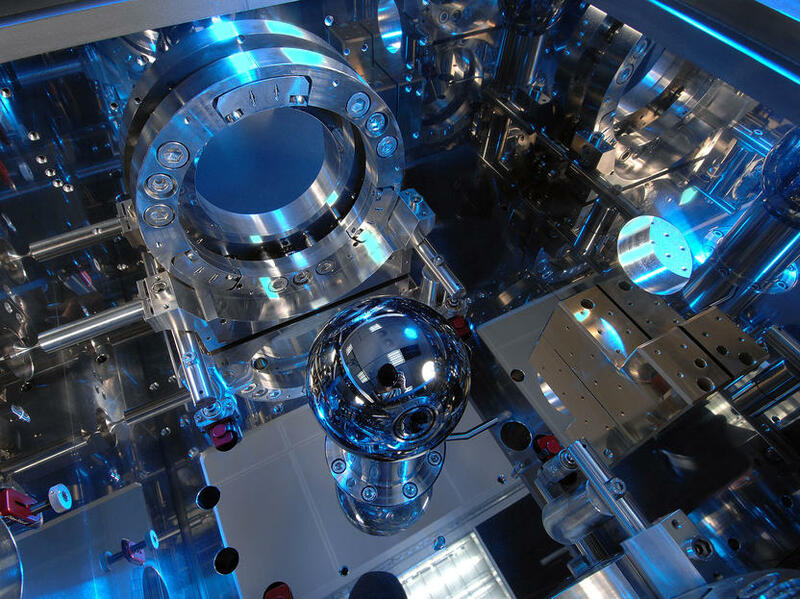 Initially, the number of atoms in an approximately 1 kg heavy silicon sphere is calculated by determining the sphere‘s volume using a special sphere interferometer and using a (separate) measurement of the atomic volume made using a special X-ray interferometer. The ratio of the two results equals the number of atoms in the sphere. The number of silicon atoms in a mol is calculated by dividing the mass of the sphere, determined by comparison with a standard mass, by the molar mass of silicon. However one difficulty arises: silicon has three stable isotopes with molar masses of 28 g, 29 g and 30 g and it is necessary to know how many atoms of each isotope are contained in the crystal in order to determine a mean molar mass. This is achieved using a mass spectrometer. For the latest measurements, the researchers have produced an enriched silicon crystal, with which a measurement uncertainty of 3 x 10-8 for the Avogadro Constant can be attained. It was not possible to achieve a more accurate result because the oxide layer on the silicon spheres did not have such a ­simple structure as assumed because the polishing process caused a contamination by metal atoms. This brief presentation of the measurement method should not hide just how complex and technically demanding this experiment proves to be. As the Avogadro constant is linked with Planck‘s constant by a precise set of fundamental constants, it is an important input value for the kg definition. Any research result is worthless if it is not independently confirmed. Therefore, efforts have been made within the Avogadro project to ensure that all measured variables relevant to the result have been measured in different laboratories as far as possible independently and then the results compared and evaluated with each other to achieve the greatest possible redundancy. For two variables, the lattice parameter and molar mass, there has, up until now, only been one experiment in the world as a whole. 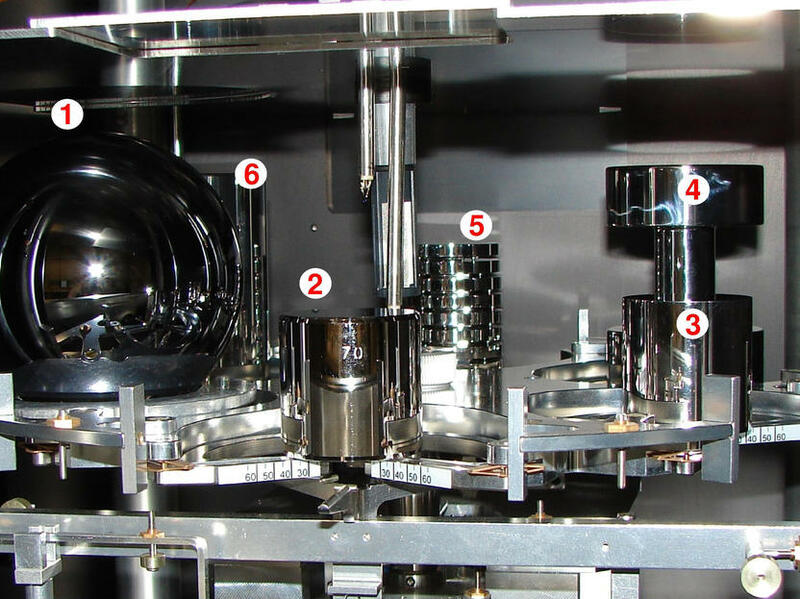 While the lattice parameter is to be determined by the PTB itself for a second time, various metrology institutes were asked to help in verifying the molar mass of the enriched crystal used. Since then, the Canadian metrology institute (NRC) and the corresponding laboratory in the USA (NIST) have published their first measurement results. Here two things are pleasing: firstly, the results essentially confirm the PTB values. Secondly, where the PTB results are concerned, small deviations from the PTB results were identified, the cause of which can now be investigated. 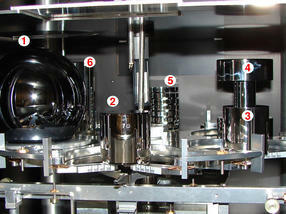 Up until now, two experiments using Watt balances have been carried out. In the USA, a comparable value was published a number of years ago (measurement un­certainty 3.6 x 10-8). Unfortunately this value and the Avogadro value disagree by some 1.6 x 10-7 from each other. Since then, work on this “research” experiment has largely been suspended in order to set up a small robust watt balance for calibration purposes. Hence it will be almost impossible to clarify this discrepancy. Likewise, a further independent measurement using a Watt balance was started many years ago at the British metrology institute (NPL). This numerical value also differed from the American value, although it was within the range of the Avogadro value. However, as the measurement uncertainly was relatively large and was not to be further reduced, NRC took this balance and reinstalled it in its own laboratory, where it quickly achieved new and more accurate results (measurement uncertainty 6.5 x 10-8). In autumn 2011, new data published for this Watt balance experiment and also independent measurements for the isotope ratio in the Avogadro spheres were again pleasing because the results of both experiments could be brought into close agreement. The final stages now involve correction of small discrepancies and achievement of the necessary measurement uncertainty of 2 x 10-8. The Avogadro project plans to reduce its measurement uncertainty from the existing 3 x 10-8 to better than 2 x 10-8. To achieve this, both silicon spheres are to be repolished to improve the roundness and simplify the structure of the oxide layer. To meet the requirements for a new definition, a successful conclusion to a third experiment for determination of Planck‘s constant is still outstanding. 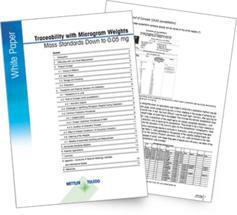 For many years, metrology institutes in Europe have been endeavouring to build Watt balances. To accelerate this process, the coming three years will see a joint project between these institutes and the Avogadro project to deal with possible discrepancies and successfully conduct a third independent h experiment. Only when all data meets the requirements of the Metre Convention both in terms of value and uncertainty can a remodelling of the SI units and their new definition be completed. Alongside the kilogram, the kelvin, ampere and mole should then be defined based on fundamental constants. The next start-up is already planned for 2014, a new challenge for metrology. Consequently, the coming years up to 2014 will be characterised by a PTB-NRC duel to achieve the best measurement of Planck‘s constant, with the Avogadro experiment currently being in front by a nose. 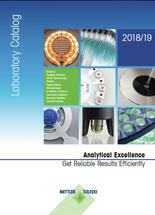 First publication: Becker, P., q&more, 1.2012.